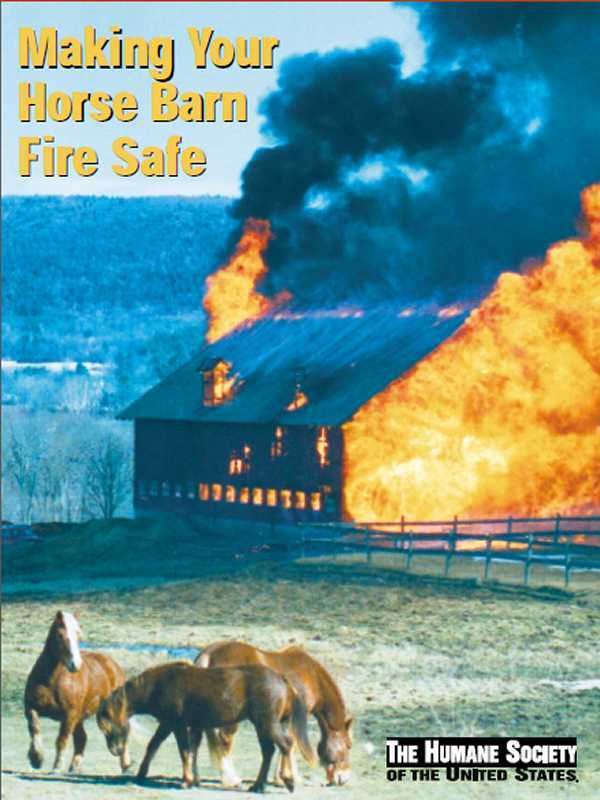  INFORMATION LINK:  PROTECTING YOUR ANIMALS IN AN EMERGENCY! The LRTC "Can Do Crew." Difficult jobs done while you wait. The impossible may take slightly longer. The team responds to close to 150 calls per year on average. 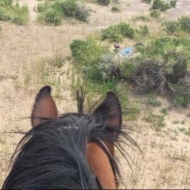 Some of the more notable calls in which photo records were able to be taken are provided below. indicates a video of the incident is included. 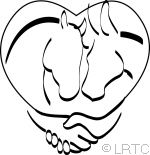 The information sheets and procedure guides presented below are primarily intended for persons associated with or working with the LRTC Emergency Response Team. 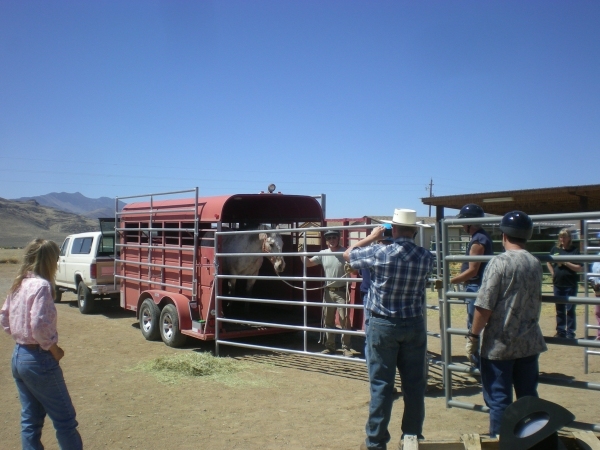 However, this information may be useful to other groups or private individuals who may wish to prepare for emergency activities involving horses and other large animals. 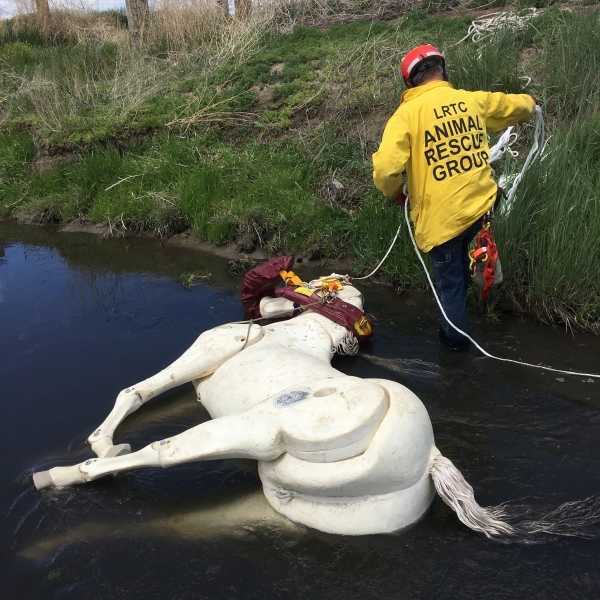 Everyone working with large animals and rescue equipment during training and actual emergency conditions should always exercise common sense, caution and safe practices. 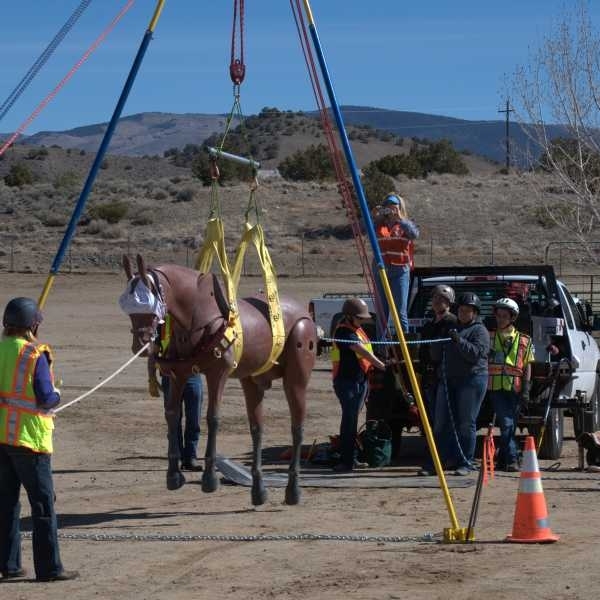 The descriptions provided below are for basic orientation and familiarization and are not a substitute for formal hands-on training or personal responsibility when working with and around large animals and specialized equipment. The scenarios listed below are for illustrative purposes only. 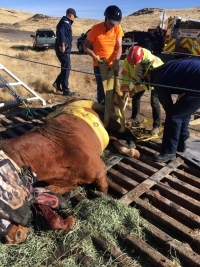 Their purpose is to familiarize readers with modern and safe approaches in dealing with large animal rescue situations. The information presented is not a substitute for qualified hands-on training. Some of the techniques shown can be hazardous if not applied correctly. Please take all of this information as "awareness level" only! Thanks. 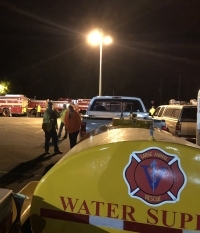 Whether responding to a technical rescue or a wide area emergency, credentialed response units (those that meet response criteria and are staffed by appropriately trained responders) should display proper identification in order to be recognized by law enforcement and other public safety officials as being legitimate. Having some form of identification viewable from the roadway has been a long time tradition. 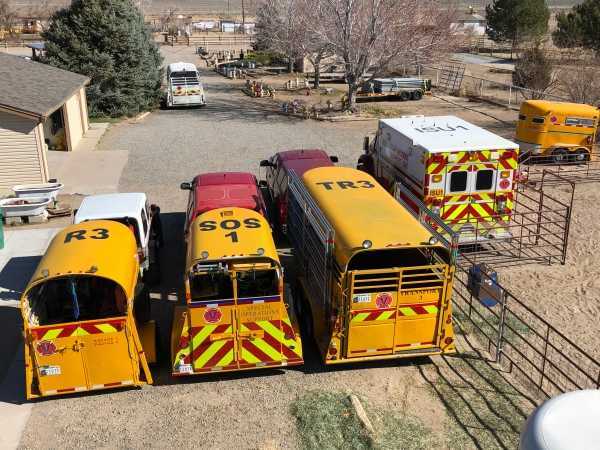 An analysis of wildfire incidents where volunteers were operating on the ground while air operations were taking place uncovered several incidents where Air Attack Supervisors had some confusion as to who was operating underneath them and whether the vehicles below were even occupied or abandoned. This confusion involved several types of resources. 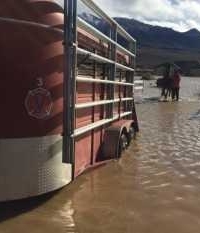 Our position is that volunteer responders should reduce rather than add to the degree of confusion, providing a distinction between responders attached to an incident, civilians who are just trying to get out, and unoccupied vehicles and trailers. In addition, roof top identification large enough to be easily read by aircraft can be a safety asset in the event the Air Attack Supervisor or Helco Supervisor observes a response team heading into a dangerous situation. Being able to immediately identify the unit can facilitate getting a timely message to the correct unit to withdraw. 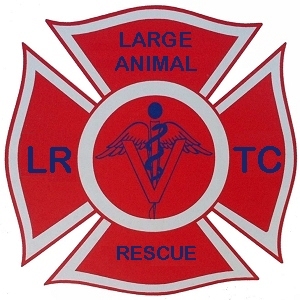 LRTC receives the first Air for Paws equipment delivered in Nevada! Improving safety and reliability under stressful conditions. Basic concepts for training and deployment. We feel that it is appropriate to pay memorial tribute to Capt. John Nunes of the Contra Costa (California) Fire Protection District. 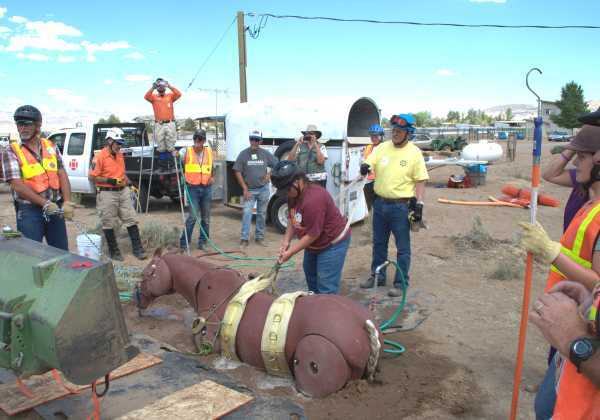 John was significant in motivating many of us to become involved in technical large animal rescue and evacuation activities. 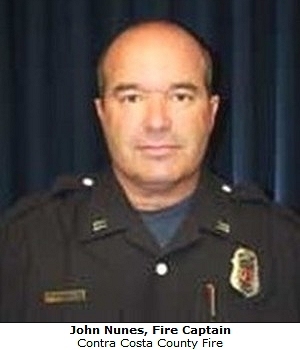 John passed away on April 4, 2009, from a service related illness. 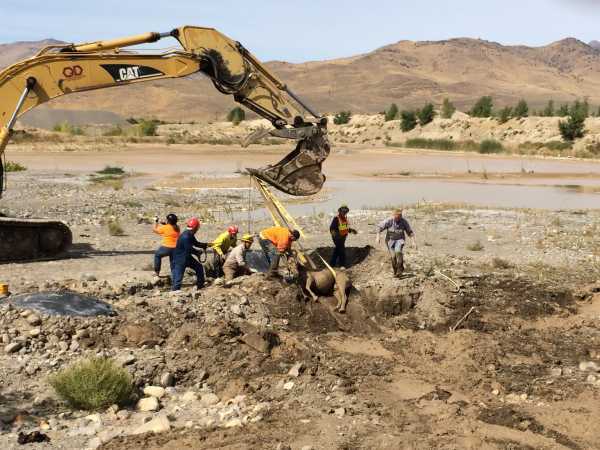 His legacy includes the continuum of career personnel and volunteers who train so that they can help animals and their owners when serious emergencies and disasters strike.